Post Legal Jobs > Employer Legal Articles > > Employers > Legal Employer Hiring Strategies > Writing Legal Job Postings > The Legal Job Postings That Always Work! Every day, a large number of legal job seekers enter hundreds of keywords into different job search engines. During the normal course of things, a job seeker might glance through various job posts and check for a few job descriptions. While legal recruiting firms may regularly talk about the ineffectiveness of their job postings, they most often forget that, to get a right candidate for the job, they need more than just a job description. Hence, to receive better results from their law job postings, recruiters need to follow a few guidelines. Thorough analysis of the job description: Many times, the job postings are just a copy of the job descriptions. As a result, job seekers get confused and find it difficult to understand a clear picture of the position. If you post legal job descriptions without defining responsibility of the position and the expertise required, you can but obviously expect inadequate results. Therefore, it is highly recommended to avoid posting the description of a job requisition for this very reason. Using the details of the job requirement as a basis of information, readily serves the purpose. Concentrate on the job profile: This is one of the vital components of an effective job posting. The description needs to display the real roles and responsibilities of the position. Mention the details that will attract the candidate's attention and encourage them to apply for the job. If the opening is to work on a leading initiative for the organization, then it's important to add the details in the posting. All the other details are also significant, but providing the key roles and responsibilities will help potential candidates to find if they match the job description and whether the position is worth pursuing, or not. Stick to simplicity: Reading the same job posting repeatedly makes the job seekers feel tired. Spice up the job post by adding detailed information on the responsibilities of the new hire in the new role. Including certain interesting facts about the organization can also make your job posting stand out from the clutter. However, you need to be concise and to the point. Job seekers generally avoid reading lengthy postings, just to find out more details on a vacancy they may or may not be suitable for. Details avoid unqualified resumes: This factor is crucial for the recruiters who want to reduce the volume of unqualified candidates applying for the position. Legal jobs need candidates with a sharp mind and understanding of the law. Stating the minimum qualification requirements in the legal job posting draw a demarcation between qualified and unqualified candidates for the position offered. The opening line for the skills and requirements part of the description should read something like this: "In order to be considered for this position, you must meet the following minimum qualifications." Some candidates might be turned off at the very first instance, but those are usually the ones who don't match the job description in the first place. 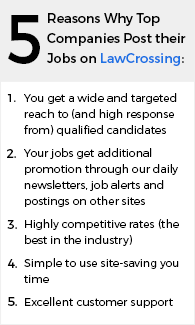 If you follow the above mentioned guidelines, you will maximize the response count of interested, qualified candidates, generated through your law job posting on the job search engines. Additionally, this will also ease the workload, and you can focus more on the candidates that qualify for your positions. Summary: Efficient job postings are instrumental in advertising open positions among job seekers. To receive a suitable response from qualified candidates, you need more than just a simple job description on legal job posting. Hence, writing an appropriate job post is essential to the success of your overall recruitment efforts in law job posting.